if the defending pokemon is barney, he is now knocked out. if not, this attack does 60 damage. 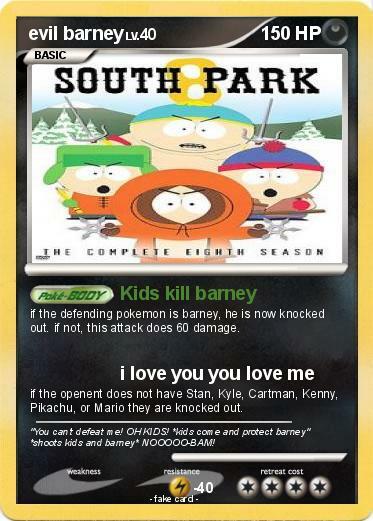 if the openent does not have Stan, Kyle, Cartman, Kenny, Pikachu, or Mario they are knocked out. Comments : "You can't defeat me! OH KIDS! *kids come and protect barney" *shoots kids and barney* NOOOOO-BAM!